1. Last night I did a little trick in my kitchen. Earlier this week, I went to Target and bought 10-packs of oil-rubbed bronze knobs. 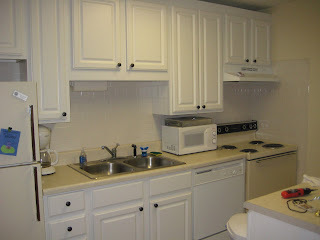 My kitchen had plain boring gold knobs that looked cheap. So, at C's suggestion, I switched them. The before shot is not very exciting, so here is the after shot of my little kitchen: See if you can find the froggy "Congratulations on your new pad!" card my mom made for me, the flatware sitting on top of the microwave because none of the drawers are wide enough for a flatware divider, my work ID badge, my work nametag, my trash can poking out from under the kitchen island so I would remember to take out the trash, and my trusty battery-powered Black and Decker drill (that's for you, Drew). Next kitchen project: figure out why my stove keeps burning the cookies. 2. Guess who is making her first-ever trip to a Tennessee game, aka to Neylend Stadium, aka a Garbage Truck Worker Convention? Actually, I'll be one of the garbage truck workers in orange, because I am always for any team that plays UAT. Not that I think the Vols have a chance of winning. But wouldn't it be crazy if they did? Stranger things have happened. 3. Evan introduced me to the greatest picture book ever - In Character: Actors Acting. It's got all these famous actors making the face/body language they would make in the most ridiculous situations. Not just "happy" or "sad" but really descriptive emotions. Click here to read an article/review about the book and see a few of the best shots. And if anyone wants to order a used copy for me for Christmas, there are several in "new" condition on Amazon for under $5. 4. Am I the only one who hasn't been to a pumpkin patch this fall? I guess there is still time to get a pumpkin to carve, though if I do, I'll more than likely get it from Kroger. Although, someone pointed out to me that pumpkins have seeds, and you may remember how I feel about those. But inside the pumpkins I have seen before, the seeds aren't lined up like a small infantry. I guess I could always recruit someone else to gut it, and I could just carve it afterward. Hmm. 5. Run, Fat Boy, Run came to the house yesterday. This was David Schwimmer's feature film directorial debut and I had heard it was really good. And I was right! The first 45 minutes of it were great. The rest, I can't wait to see... because I fell asleep. Again. But add it to your queue if you have one. Mom sent us that same card! I would like to see more of your "new pad", please. The new knobs look lovely. pumpkin seeds are the worst of all....run for your life. i think they smell bad too.